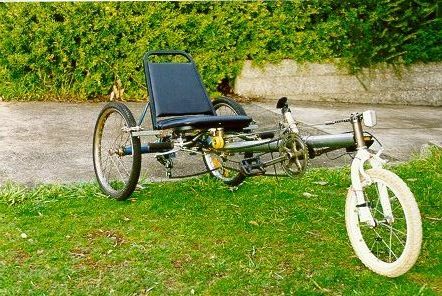 I have been working on this trike for quite a while now after finding an old upright trike for sale in a bike shop. It's only part finished, the picture showing some of it's progression. 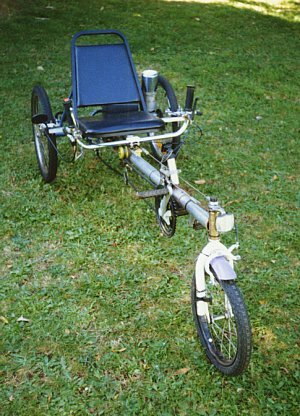 The rear end on this sort of trike I have found difficult to design so it could be easily made in my workshop with very limited tools and here it was all done for me. I would have liked to have the 2 rear wheels driving but that isn't easy using what already is here and it doesn't seem to pose problems riding. This would mean having some sort of differential usually having a cog with inbuilt ratchet on each wheel and a jack-shaft. My first design idea was to have an intermediate hub as shown in the 2 pictures. It was to be a normal steel hub with 5 speed cluster plus another cog welded to the spoke flange connecting by chain to a cog on the rear axle. This didn't end up so easy to get working properly so I fiddled a bit and got the cluster to fit on the back axle instead. The problem was trying to stop the forward going chain fouling the rear forks. 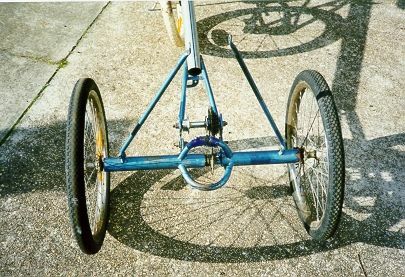 The rear axle dia is the same as a normal bike 3 piece pedal axle so a cottered pedal crank has the arm cut off then the threaded part of a rear hub welded to it. I found out doing this that the threaded cone nuts on a bike BB is exactly the same thread and size so this could be used instead of wrecking a good hub. The cassette is screwed onto this unit, a flat section is filed into the rear axle for the cotter pin to hold the assembly firm. The left rear wheel has a long axle fixed to it running up through the cluster and into a sealed bearing on the other side of the cluster. On this one the right wheel has an axle that screws into a floating nut contained inside the rear axle assembly. 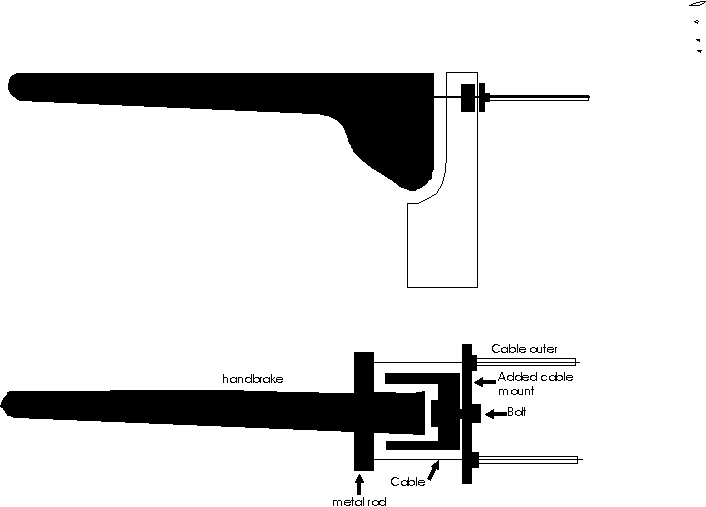 It would be easier made as shown in the drawing. I have a gap between the left wheel and it's nearest bearing so I can mount another cog. This will be connected to an electric motor that has on it's shaft a cog with a ratchet built in allowing it to freewheel. 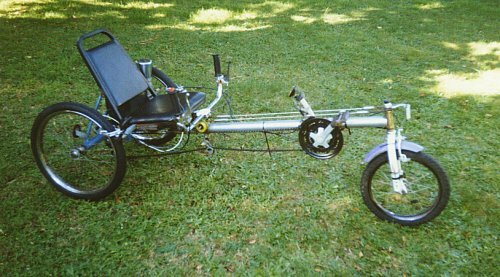 With the length of the wheelbase there is noticeable flex in the boom when I sit on the trike. The flex affects the steering loop mainly making it slacken a little when I'm seated but does also give some degree of suspension but I don't expect it to be a a problem in the future. 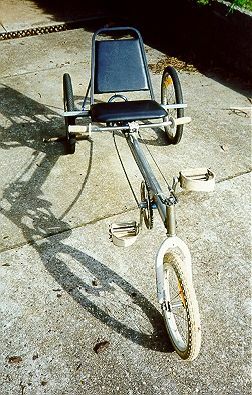 The steering is a closed loop using stainless steel rods and bike chains at each end. 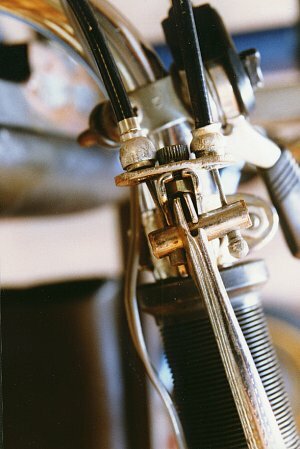 2 small cogs are mounted on the steering head and handlebar steering arm. 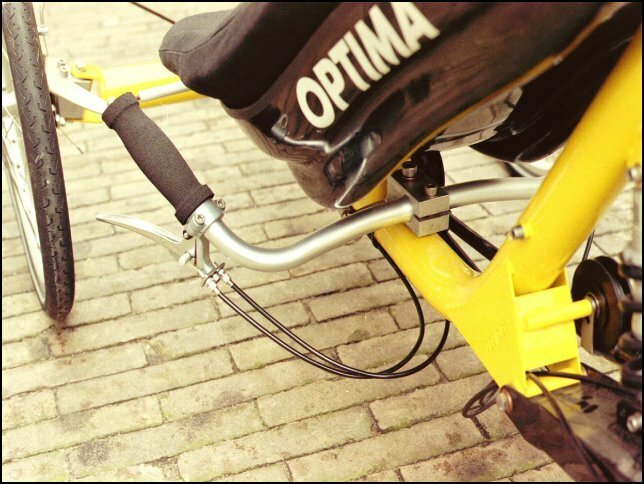 On a bike steering head there is usually a small keyway the holds things like the front reflector bracket straight. A small washer usually found in bike steering heads with this keyway is welded inside the small steering cogs and are held on in the usual way. 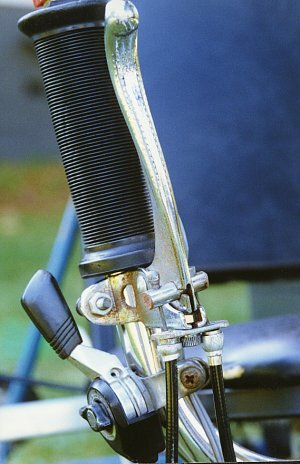 The handlebar steering assembly is as shown in option 6 on the my under seat steering mounting page. 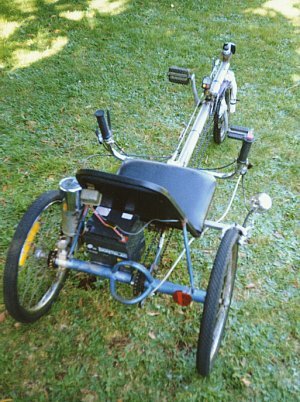 The only difference is I have used a 'clam shell' steering head assembly to hold the handlebars on instead of what's shown on the drawing. It hasn't been easy getting the handlebars clear of the chain on all gears as both go below the seat and above the boom. 2 skate wheels have been fitted to route the chain. 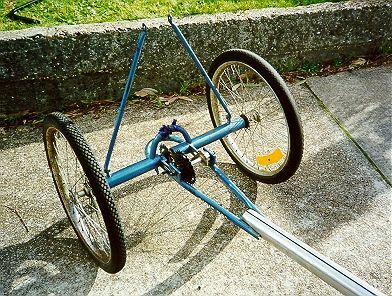 Not knowing what angle to make the steering head I ended up setting it temporarily to the same angle as the 16" bike the forks and wheel came from. This has proved too steep for the closed loop steering as the chain isn't straight with the steering cogs. The front steering tube is only tacked on so I will shorten the wheelbase slightly and make the rake more vertical. 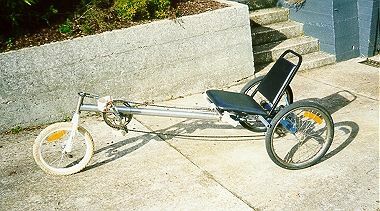 Many of the commercial HPV's of this style have 20" wheels all round. With this setup I don't like the angle of the boom with a 20" front and the it makes the pedals higher than the seat. I much prefer exactly the opposite so am stuck with a 16" front for now. 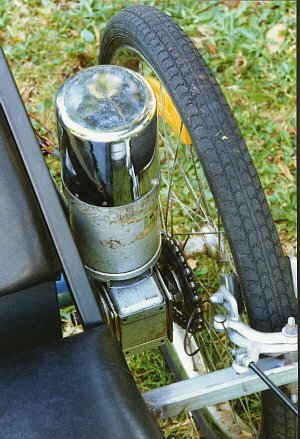 The BB mount is semi-permanent using exhaust tubing. I found the next size up exhaust tubing to the boom slips just neatly over the boom. Another piece is cut in half as a removable top cap. This is held on by assembling it all on the boom and then drilling the hole for the bolt. All is then removed and the nut welded into the boom flush with the top of the boom. 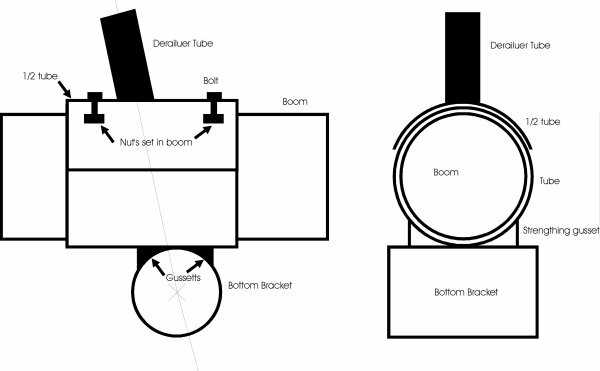 The angle and position of the derailleur mount needs to be correct for the chain to de-rail properly. I welded 2 gussets to help support the BB as I'm not sure it would be strong enough without. There's a lot of force at this point when pedaling. Seat is a kitchen chair, modified a little. 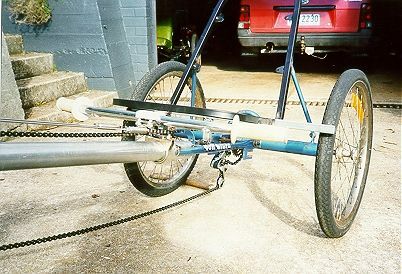 The front bottom bracket is welded to a tube that slides over the main boom. A 1/2 tube fits over this at the top with the front derailleur tube welded to it and is bolted in 2 places to the boom allowing it all to be semi adjustable. 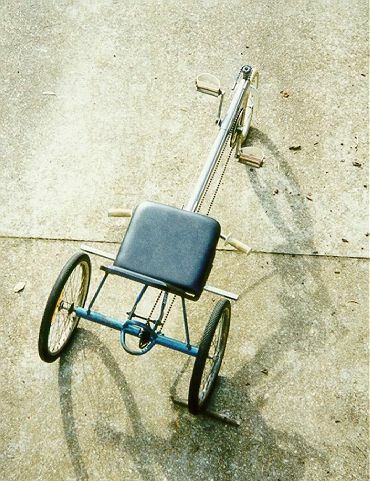 (A nut is set into the boom and welded) It's length looks deceivingly long being the same wheel base as the S&B Speedster and 10 cm shorter than the Comfortcycle Chaise. 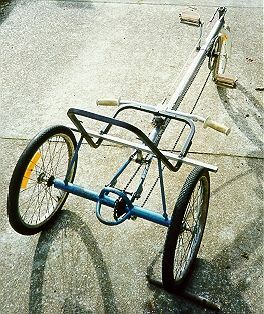 The trike has the potential to have 3 calliper brakes so I've tried an arrangement where one lever works the 2 back callipers and the other the front. See pic 1 and pic 2 & drawing. In all it only took about an hour to make this temporary prototype so I'm quite pleased with it. Uses a normal bike handbrake assembly. A small metal plate is added to take the 2 cables. It's held in place by a bolt and nut mounting through the ex cable hole. 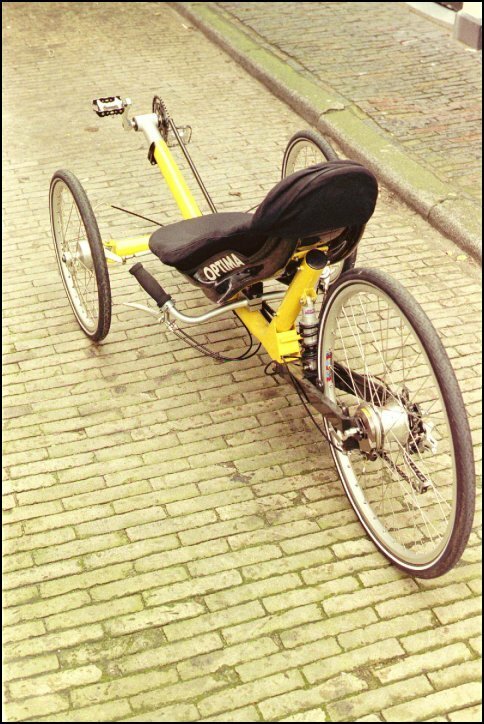 Also have a look at the Optima Trike Pic 1 & Pic 2. In the past while, I've been playing around with the idea of giving the trike motive power of some kind. 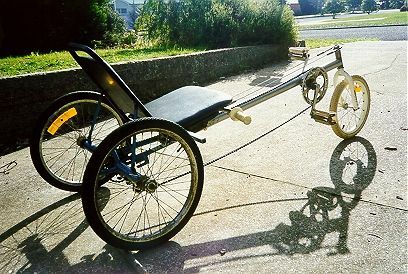 I bought them from Astec Equipment Services, a company that repairs, reconditions and customises Wheelchairs and other disability equipment and recycles electric motors and batteries suitable for Power Assisted Bikes. 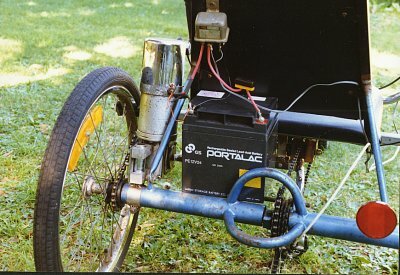 Prices are very cheap, EG deep-cycle batteries are $20 2nd hand and motors not much more so are excellent for playing around with ideas. The motor really doesn't draw enough current at present(about 15 amps at close to stall) on 12 volts so I'm considering trying 24 v, the problem is this adds more weight. 19th October 1999 This motor/gearbox is now being tested on a Power Assist Trailer. A bike clutch ratchet is mounted on the rear axle. 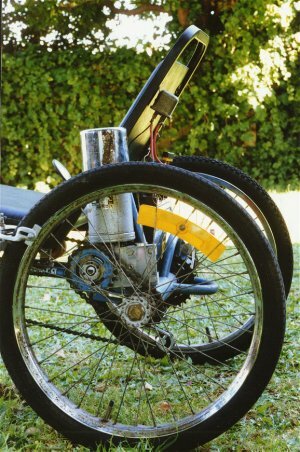 This allows the trike to freewheel when not using the electric motor. There was one unexpected downside to this that is very annoying. 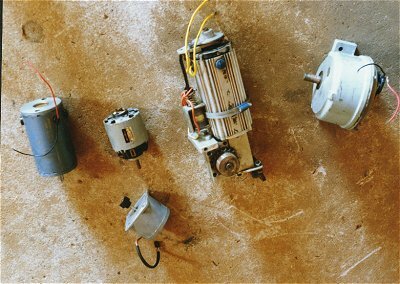 The motor has a friction brake at the top (under the chrome cover) that is released by a solenoid at startup. This makes it impossible to roll the trike backwards as the clutch added only goes one way. I find this very annoying, especially navigating in traffic as well as parking and often have to pick up the back end to manoeuvre it. A piece of exhaust tubing was used on the main axle. It was split and a long nut welded across the gap. The nut is then cut in half and one side drilled out making this an adjustable clamp. 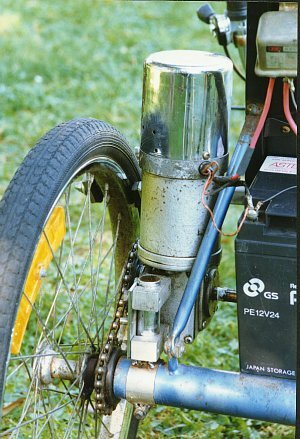 With the riser tube welded to it the motor can be moved up or down to adjust the chain tension. The U shaped handlebars added make it a lot more comfortable to ride than the straight ones shown above. 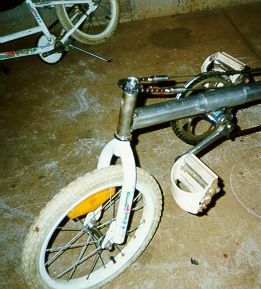 They were taken from an upright exercise bike, with the 2 bars welded together in the centre. All of the electric's are just mounted temporarily at present. The relay is one often used for car spotlights. Battery is really too big (read heavy) being a deep-cycle 24AH. Really the motor is too heavy as well for any type of speed.